On Tuesday, August 19, 2014, you’ll find Temecula Valley wines at the 25th Annual Taste of Mainstreet in downtown Encinitas. Representing the Temecula Valley at various storefront “Sip Stops”, Baily, Callaway, Danza del Sol, Europa Village, Falkner, Hart, Leoness, Monte De Oro, Vindemia and Wiens wineries will be pouring their award winning wines. Advance tickets are just $35, including food, wine and beer (for those 21+). Same day tickets (if available), will be $45. Click here for ticket information. And on Saturday, August 23, 2014, from 4-7pm, you’ll find us at the Uncorked Wine Walk at Westfield UTC. Here you’ll savor wines from 12 Temecula Valley wineries including Bel Vino, Callaway, Falkner, Hart, Leoness, Lorimar, Maurice Car’rie, Oak Mountain, Palumbo, South Coast, Vindemia and Wilson Creek while tasting bites from UTC’s newest restaurants. Tickets are still available; purchase them here. In vineyard speak, verasion is a term used to describe the changing of color in a grape cluster. All grapes are green up this point, but as the ripening process evolves, the clusters will begin the process of turning into those recognizable hues of golds, pinks, reds and purples. The grapes at this stage are sour and immature, but during the next few weeks as the fruit matures, astringent malic acids turn into soft tartaric acids and the sugar levels begin to rise rapidly. There’s lot of action in the vineyard during this time. The leaf canopies are constantly being pruned to allow just the right amount of sunlight and air to circulate though the vines. 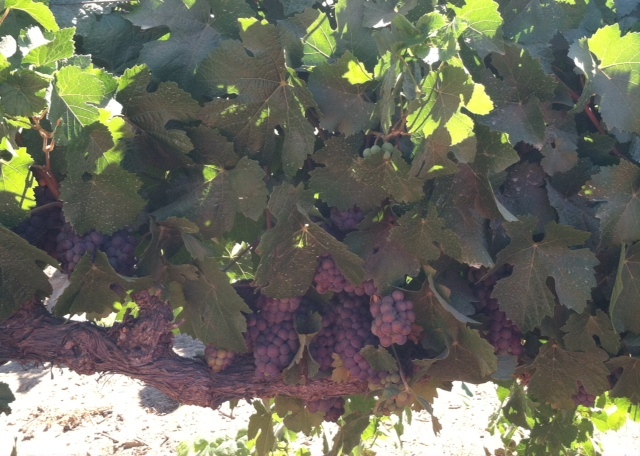 Clusters that are not ripening evenly will be dropped to allow those that are to uniformly mature. Unlike table grapes, small berry clusters are what we’re looking for as they have a better skin to fruit ratio that ensures enhanced concentrations of flavor and structure. And that’s a very important aspect for making quality wines! We’ll be praying for warm and dry weather – at least through the harvest season – to allow for the long, slow ripening process that our winemakers love. What actually triggers verasion remains a mystery, but we can be sure that Mother Nature holds all the cards! January is California Restaurant Month, so we’d like to take this opportunity to preview the month-long event by highlighting the bounty of restaurants right here in Temecula Valley Wine Country. In case you needed another reason to visit beautiful Temecula Wine Country, here are eight more mouthwatering ways to get the most out of your wine country experience! The Restaurant at Ponte: Recognized as a top 50 restaurant for outdoor dining in the US by OpenTable, the Restaurant at Ponte serves a wide selection of Farmers’ Market salads, grape-wood fired pizzas, fresh pasta dishes, natural beef, sustainable seafood and homemade desserts. Chef Vincent Logan’s seasonally-driven menu uses only what is fresh and available at that time of year. Share a bottle of Ponte wine with friends over the Butcher’s Platter– the Chef’s selection of cured meats, olives, mustards and capers, or treat yourself to the Lobster Macaroni made with three cheeses and topped with herbed breadcrumbs. Whether you decide on one of Ponte’s signature wood-fired pizzas, grilled seafood options or the Chocolate Blackout Cake, you’ll always have a delicious experience at The Restaurant at Ponte. The Restaurant at Leoness Cellars: Chef Daragh Matheson crafts Italian and French provincial cuisine for this 3,800 square foot restaurant overlooking the vineyards at Lenoness Cellars. Hailing from Ireland, Chef Daragh is a classically trained chef who has worked in some of the world’s top restaurants, including the Michelin-named Whites on Green in Dublin. Guest favorites include the Mac ‘n Cheese with Truffle Oil, Hand-cut French Fries Topped with Crispy Bacon and Parmesan, and Rack of Lamb with Tomato and Mint Sauce. 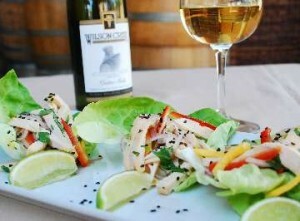 Next time you’re in the mood to be swept away on a wine and culinary experience, try The Restaurant at Leoness Cellars. The Pinnacle at Falkner Winery: Voted 2010 Best Restaurant and Best Chef by readers of Inland Empire Magazine, The Pinnacle offers Mediterranean-style cuisine and outstanding service, in addition to Falkner wines. Appetizers include Fresh Asparagus Wrapped in Prosciutto, Ancho Spiced Shrimp and Avocado, and the Trio of Mushroom Soup. For heartier appetites, the Baked Chicken Cannelloni, topped with alfredo sauce and parmesan cheese, is the perfect choice to satisfy that craving for comfort food. For California Restaurant Month in January, Chef Gianni Ciciliot will be offering The Winemaker’s Pasta- fresh pasta tossed with jumbo shrimp and fresh herbs- for only $15.00. Meritage Restaurant at Callaway Winery: Executive Chef Michael Henry creates diverse, seasonal menus that accentuate Callaway’s long history of fine Temecula wine. Having worked at many top fine dining establishments, including a stint at Cesar’s in Atlantic City for Celebrity Chef Robert Irvine, Chef Michael focuses on freshness and seasonality for the menu at Meritage. Share a variety of tapas (small plates) like Crispy Steak Fries with Parmesan, Parsley & Peppercorn Aioli, Ceviche “Mixto” with Ahi, Octopus, Clams, Mussels & Blue Crab and Asparagus Risotto Fritters with Gorgonzola & Roasted Garlic Cream with a group. The Kobe Beef Cheese Steak Sandwich with Caramelized Onions, Mushrooms, Provolone, Peppercorn Aioli & Fries and Spaghettini & Carlsbad Manila Clams & Mussels with an Extra Virgin Olive Oil, Garlic, Fennel & Baby Tomato Sauce are both popular entrees that can be enjoyed while looking out onto Callaway’s gorgeous vineyards. In January, for California Restaurant Month, guests will have the opportunity to order a Roasted Pork Belly or Grilled Jumbo Shrimp Kebob with taste of paired wines for just $20. Carole’s Restaurant at Baily Vineyard and Winery: Carole’s Restaurant menu incorporates local produce, fruits and herbs, honey, olive oil, and estate grown produce. Nosh on some Mushroom Drops- Crimini mushrooms stuffed with basil and sundried tomato cream cheese- while trying to decide between the Duet of Raviolis, the Tri-Tip Skewers with Gorgonzola Butter, the BBQ Pork Loin Sandwich and the other mouthwatering offerings on Carole’s entree menu. Sit near the fireplace, enjoy live music every Saturday and Sunday and finish off your meal with a glass of Baily’s 2006 Vintage Port. What an amazing evening! Shorty’s Bistro at Mount Palomar Winery: Shorty’s Bistro’s Mediterranean inspired appetizers, sandwiches, homemade soups, freshly made hummus, stone oven pizzas, delicious entrees and elegant desserts make it an ideal choice for wine country guests looking for variety. Meat-lovers would be thrilled with the Braciole Beef Baguette, a sandwich of seasoned roast beef, charred tomato, whole grain mustard, gouda, lettuce and onion while vegetarians can delight in The Quattro Fromaggio, a stonebaked pizza topped with mozzarella, cheddar, monterey jack, feta and parmesan cheese with fresh rosemary and extra virgin olive oil. On Fridays, Saturdays and Sundays, Shorty’s is opened for dinner, and the eclectic menu features a Sweet Onion & Chicken Tart, Seared Salmon with Sofrito and Tri Tip Roast with Portabella Mushroom. Mark your calendars for January’s California Restaurant Month, since Shorty’s will be offering Scallops and Shrimp Skewers Over Risotto, served with wine and cheesecake for a set price of only $30. Vineyard Rose Restaurant at South Coast Winery and Spa: Vineyard Rose offers wine country visitors a taste of Southern California with a hint of Tuscany. Start your day off with a delicious breakfast (served Monday through Friday from 7:00-10:45am) of Rolling Hills Bananas Foster Pancakes, Country Biscuits With Sausage Gravy or a California Spa Omelette. The lunch menu has something for everyone, with items ranging from Coconut Shrimp all the way to Lamb Osso Buco. 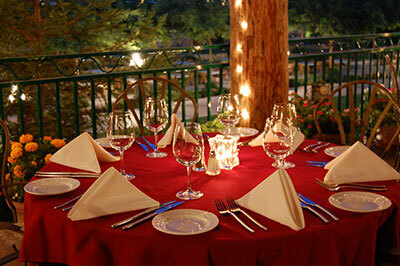 Planning a romantic dinner? The Vineyard Rose Restaurant not only offers the ambiance, but dishes like Gnocchi al Fresco and Butter Poached Scallops will help set the mood for a meal to remember. Café Champagne at Thornton Winery prides itself on its “Contemporary Fusion Cuisine,” which has won the Gold Award for Contemporary Cuisine for eleven consecutive years from the Southern California Restaurant Writers Association. The Vineyard Tapas Plate, comprised of Tuscan Salami, Garlic Herb Shrimp, Marinated Mushrooms, Roasted Tomato, Olives, Goat Cheese Spread and Cracker Bread pairs perfectly with Thornton’s 2010 Tempranillo, while the Baby Spinach and Honey Roasted Pear Salad goes well with Thornton’s 2010 Mouvedre. Dinner entrees such as the Butter Poached Lobster Panini and the Pan Roasted Maple Glazed Salmon are two of the many reasons why Café Champagne was granted 5 stars for contemporary cuisine from the Southern California Restaurant Writers. Creekside Grille at Wilson Creek Winery: Executive Chef Steve Stawinski brings 20 years of experience to the newest member of the Temecula Valley Wine Country restaurants. The Fall menu features a California Cheese Plate, Red Curry Pumpkin Dip in addition to an array of salads and sandwiches. When owner Mick Wilson discovered an allergy to gluten, he had Chef Steve develop a gluten free menu, which includes Flatbread with Zinfandel Soaked Dried Cherries, Creekside Garden Rosemary, Fresh Mozzarella, CA Olive Oil and Blackberry Balsamic Vinegar and a Creekside Burger served on a gluten free bun. Surrounded by the lush 30 year old Cabernet grapevines, herb garden and flower-filled baskets, the view and ambiance set the scene for an enjoyable day in the wine country. Anyone hungry yet? Contact any one (or all) of these fine, wine country restaurants to check hours of operation, seasonal menu items and special offers. Make your reservation today! For this edition of Winemaker’s Roundtable, we’re talking about Bordeaux Blends- specifically, red Bordeaux blends. These lush, deeply rich wines are called Meritage here in California, and Temecula Valley wineries offer a fine variety of what would be a great pairing to a holiday meal. Bordeaux is a port city on the Garonne River in Southwest France, and is the world’s premier wine industry capital. Bordeaux’s defining characteristics are its limestone soils and the neighboring rivers, which are used to irrigate the land. A red Bordeaux wine is a blend of two or more of these five grape varieties: Cabernet Sauvignon, Cabernet Franc, Merlot, Malbec, and Petit Verdot. In 1988, a small group of Napa Valley vintners formed The Meritage Association, using the term “meritage” (a combination of merit and heritage, and pronounced like the latter) to denote red and white Bordeaux-style wines made outside of Bordeaux. The term “Meritage” was created to avoid using the name “Bordeaux” for wines that are not actually produced in the Bordeaux region. Because the percentage of each grape used in Bordeaux blends varies, each year’s vintage brings different flavors and nuances, making tasting Bordeaux blends a fun and interesting experience. Red Bordeaux blends typically are rich, full-bodied wines with notes of black currant, blackberries, cocoa and cherries. Looking for a spectacular spring wedding venue to create beautiful memories of your special day? 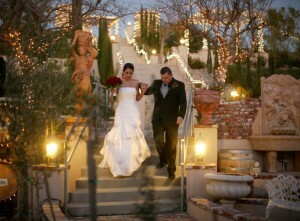 Temecula Valley wineries are filled with breathtaking vineyards for the wedding of your dreams. 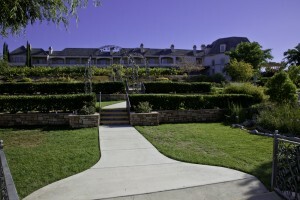 Have your dream wedding at an intimate and exclusive vineyard chateau. 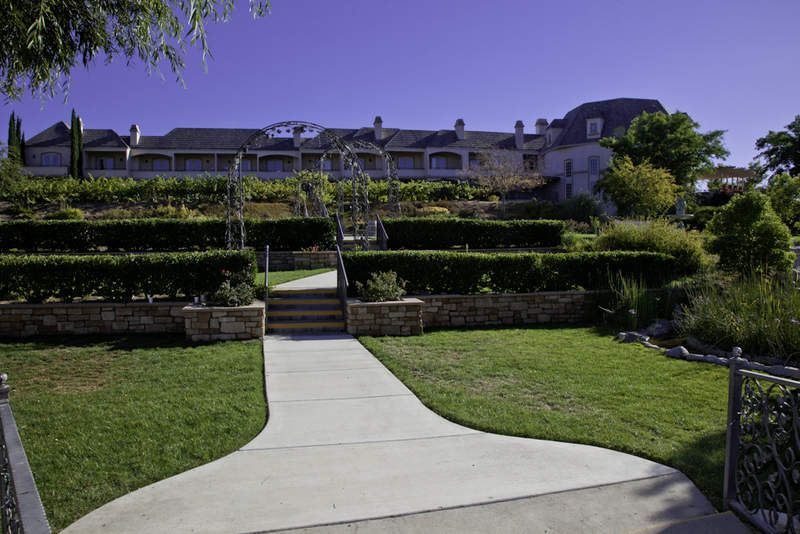 Nestled atop 11 acres of estate vineyards with an outdoor elevated gazebo overlooking vineyards, waterfalls, and a panoramic view of the Temecula Valley, the Inn at Churon Winery is the ideal private location for your special day. Keyways Vineyard & Winery offers a full range of services in a variety of locations amongst rolling vineyards. With impeccable attention to every detail, the staff at Keyways Vineyard & Winery will make your celebration unforgettable and stress free filled with excellent wine, delicious cuisine and outstanding service at this unique venue. Create the memories that dreams are made of by having your wedding at the family owned Leonesse Cellars. Located off the beaten path and nestled in the middle of wine country and gardens perched on a hilltop, overlooking a 20-acre Cabernet Sauvignon Estate., Leonesse Cellars offers a truly romantic and spectacular setting. With an old world setting of sophistication, charm and elegance, that at the same time is warm and inviting and a sensational main tasting room with a cathedral ceiling, unique glass floor and massive picture windows, Monte de Oro Winery provides the ideal venue for the wedding of your dreams. This historic winery consists of more than 315 acres and rests in the heart of Temecula Wine Country, allowing spectacular and unique views to provide a perfect romantic back drop for weddings. Guests will be able to view meticulously landscaped vines, incredible photographic opportunities and beautiful Mediterranean and Italian inspired terraces. A wedding at Stuart Cellars Vineyard & Winery is as exhilarating as falling in love. Exchange your vows on a private hilltop location lined with rose beds and majestic trees with a breathtaking 360 degree view on one of the highest peaks in the Temecula Valley. Inside the winery is a rustic style Barrel Room which is perfect for an elegant, candlelight reception or rehearsal dinner surrounded by oak barrels of aging wine. January marks the beginning of an exciting year here in Temecula Wine Country! To kick the new year off right, our member wineries have planned plenty of fun and exciting activities and events especially for you. From wine and art shows, cooking classes and wine seminars to wine and food pairing classes, you are sure to have an enjoyable time. Don’t forget that January is also California Restaurant Month, so take advantage of all the special lunch and dinner packages our member wineries have created here. Take a look below for the special events set for this month! Emerging artist, Sara Shawger is bringing a taste to Santa Fe New Mexico to Old Town Temecula. Sara’s collection of introspective paintings and abstract drawings will be featured at Lorimar Winery’s Old Town Tasting Room during the month of January with a special “Meet the Artist” reception on January 22nd from 6pm to 9pm. Call 951.240.5177. Chef Michael Cragg of Temecula Catering teaches you to make a gourmet meal! A complete hands-on experience, with all materials provided. Check out the menu here. To make a reservation, please email vandrews@oakmountainwinery.com or call 951.699.9102. Bring those unwanted wrapped gifts for the White Elephant gift exchange. Tickets are $10 for Wine club members and $15 for Non-Members. Price includes a ticket for the White Elephant exchange, a glass of wine, all you can eat potato soup & rolls. Come by for a great evening by the fire! To make a reservation, please call 951.699.9102 or email vandrews@oakmountainwinery.com. Cozy in for a heart-warming glass of wine and music at Leonesse Cellars 3rd Sunday Concert. From 1pm to 5pm, enjoy the music of the Vineyard Troubadour with special guest artist, Steven Kinsey. A Taste of Winter is the first in a series of four seminars with Callaway’s winemaker, Craig Larson. Journey through various topics of winemaking including hands on instruction on vineyard management, the harvest and crush processes, fermentation, barrel aging and even how to taste, serve and store wines. For reservations, call 951.676.4001. Join South Coast Winery for cooking and wine the Wild Women Way! Just $35 gives you the opportunity to be a part of this special day. Best of all, proceeds benefit a local community charity. Audience participation encouraged; sense of humor required! Call 951-587-9463 X7210 to reserve your place today. Meet winemaker, David Vergari for a foray into the fun world of wine. Learn about the passion and experience their new winemaker is bringing to the bottle. Call 951.699.0099 for information and reservations. We look forward to seeing you this month in Temecula Wine Country! So Cal Wine TV – Visit Leonesse Cellars!